The Scoop loves to scream about ice cream. However, life is really about celebrating our blessings and having an attitude of gratitude. Thus, The Scoop has created The Scoop Ordinary Hero of The Month Award, so we can scoop and honor those ordinary people who are doing extraordinary things. We are in hopes that you and your families can help by spreading the details about the contest, submitting inspiring and touching nominations, and celebrating and honoring the chosen recipients. Our Ordinary Hero for the month of September is Kenny “Cousy” Caldwell. Per request of Kenny, 10% of all proceeds from Chocolate this month will be donated to Zionsville Lions Club. Reflecting back on growing up in Zionsville, Kenny “Cousy” Caldwell has certainly made a significant impact on our youth, his coworkers, elders, volunteers, town officials, and even strangers. If you have been gone for twenty years, not to worry! Kenny will still remember you, your siblings, where you lived, and surprisingly some game scores no matter what sport was played. In his own way, he nourished our childhoods and helped grow our confidence in our awkward teenage years. Many who have grown up in Zionsville have had the pleasure of knowing Kenny as a big brother, loyal friend, and a trusted citizen of Zionsville. We became accustomed to seeing him on his moped with a tall orange caution flag while driving to the Azionaqua, Lions Park, or Big Dave’s Deli. Kenny was the crossing guard at the corner of 6th Street and Oak Street for many years back in the mid 70’s and 80’s. He would assure the safety of all the young children who walked to Eagle Elementary. Every morning regardless of rain, snow, or sleet Kenny was there. He never missed a day! His smile reassured us that school was going to be fun. It was not uncommon for Kenny to help change a flat tire or make sure you would get to school safely. Kenny is also a member of the Lions Club and was the little league announcer for 15 to 20 years calling all the games. He knew the names of every child who came up to bat and called every play with enthusiasm. A greeter is the exact word to depict Kenny. He represents Zionsville through and through and certainly makes everyone feel loved and welcomed no matter if one is visiting Zionsville or attending The Zionsville Christian Church. Most certainly Kenny played an intricate role in the lives of most young adults who grew up in Zionsville. His smile, his courage to take on life regardless of any circumstance, his ability to love unconditionally, his loyalty of taking on any position and going above and beyond, his gift of encouraging others and caring to remember their name is truly the epiphany of an Ordinary Hero. How do you define an extraordinary woman such as Joy? You can simply look at her name; she is the epitome of her namesake. Synonyms; delight, great pleasure, joyfulness, jubilation, triumph, exultation, rejoicing, happiness, gladness. Joy radiates from her soul! 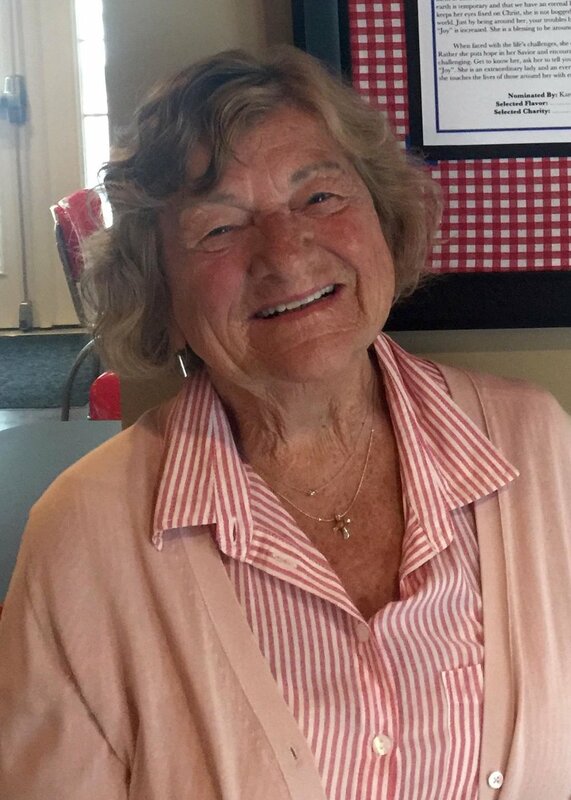 She reflects and spreads herself wherever she goes, whether it be in her community, with family and friends, in her church or at Zionsville Meadows where she faithfully volunteers. She is such a “Joy” and encouragement to both the children and those of us who oversee the Sunday School. She is always looking for specific ways to pray for the children and us. Using her gifts of encouragement, she uplifts others around her and reminds them of their eternal and infinite worth. She reminds us all that our life here on earth is temporary and that we have an eternal home in heaven. Because she keeps her eyes fixed on Christ, she is not bogged down by all the strive of this world. Just by being around her, your troubles become smaller and your own “Joy” is increased. She is a blessing to be around! When faced with the life’s challenges, she does not let them it rob her "Joy”. Rather she puts hope in her Savior and encourages others, even life is challenging. Get to know her, ask her to tell you her story, and the source of her “Joy”. She is an extraordinary lady and an every day Ordinary Hero for sure, as she touches the lives of those around her with endless “Joy”! A hero is defined as a person who is admired for their courage, outstanding achievements, or noble qualities. Deputy Jacob Pickett of Boone County Sheriff’s Office was said to have constantly strived to be the best leader that he could be by always putting others before himself doing so as a Deputy, beloved husband, and caring father. He lived each one of the Sheriff’s Office value points every day – Integrity, Leadership, Loyalty, Professionalism, and Commitment. Deputy Jacob Pickett was a true Ordinary Hero. Deputy Jacob Pickett allowed his selflessness to shine daily. While in uniform it was not uncommon for you to see him greet children at school or even organize a Christmas card drive. When off-duty he would rescue animals with his wife, Jennifer. His passion for animals, especially his K-9 partner Brik, could be seen when they were together. If Brik was not by his side, he was always talking about him. Deputy Jacob Pickett was a K-9 handler for the Boone County Sheriff’s Office. He and his partner Brik had patrolled together for more than two years. Deputy Jacob Picket and Brik, his K-9 partner, were warriors, Deputy Jacob Picket laid down his life for us, the community. He is an amazing example of what strength, courage, and sacrifice looks like in an Ordinary Hero. Deputy Jacob Pickett served in life and chose to continue giving of himself and changing lives of others through organ donation. A true hero, one who will never be forgotten. Craig Anderson is an Ordinary Hero. Living in Zionsville, and working for Duke Reality, he has gone above and beyond to care and look out for my family. Although I personally did not know him very well at the time, he stepped in to help when my father passed away from stage 4 gastro-intestinal cancer. He was not asked, but took it upon himself to do anything and everything he possibly could to comfort and support my mother, sister, and me. I knew Craig from about the age of 10; I am 16 now, as he was one of my father's good friends from work. I would see him every time I would follow my dad to his office at American Construction Company or when he would come over to discuss business or to simply just spend time with my dad. Of course, as a young kid, I thought he was a "as tough as nails" businessman. But after my father's passing, I experienced first hand Mr. Anderson's giant heart and compassion. My father died when I was only 12 and this was devastating for my family and me. Mr. Anderson immediately jumped in to help us in any way possible. For the years since my father's passing, Mr. Anderson has done so much for my family that we can never return. He has helped my mother find a job following my father's death as well as beginning a golf outing in honor of my father, which also raised money towards college tuition for both my sister and me. I have been so incredibly blessed to have someone like Mr. Anderson in my life. He has been an inspiration to me. He shows strength and courage through his grace and humanity. I have so much respect for Craig Anderson because of the things he has done for no reward. I have already mentioned the numerous times he has helped my family immensely and I hope to begin to return the favor with this nomination. Mr. Anderson, you are a true Ordinary Hero. If something painful happened, how would we respond? What if our only vision of the future was foggy and uncertain? Whenever I ask myself that question I come back to think of dear Bess Malek, my Ordinary Hero. Four years ago, Bess's husband had a virus that severely affected his brain, causing him to go into a medically induced coma and come out of it with short-term memory loss. To support his needs, Bess was forced to have her husband live in an Assisted Living home, where she constantly visits him and leaves knowing that he will forget she was even there. Through her messy life of pain, Bess's sweet heart endures because of her continual dependence on God. Raising four children, Bess works twelve-hour shifts at Riley's Hospital twice a week. Her patient care for her kids amazes me. If I were in her shoes, my temper would eventually come to a peak, but Bess, rather that raising her voice only softens it, gently explaining and helping. Her kids not only see her kindness in their house, but in her love for the poor and helpless. Her broken heart melts towards the broken world around her, offering listening ears and compassion. Recently, Bess met a poor soul at McDonald's and offered him food. He gratefully accepted, and Bess and her kids had a wonderful lunch conversation with the fellow Christian, celebrating God's love and goodness. Bess also cares for the lost every Thanksgiving. Not only does she invite family over but anyone she can find, even someone off the street who needs special love and attention. Bess Malek appreciates the heart of every hurting soul, finding beauty in the lost and hurting. When I first met Bess a year ago, I was one of those hurting souls. Bess is sunshine in my life. She loved me in a way I had never been loved before. Her joy, her simplicity, and her gratitude blessed me immensely. She saw beauty within me and would always ask, "How are You?" How am I? How can one respond to such love when that refreshing heart is only drawn from a shallow spring of tears flowing from a broken heart sustained by a greater flow from the God of Love? My dear friend Bess, thank you for your love and impact in my life and in so many others. You are my Ordinary Hero. Dustin Campins is a true ordinary hero. In addition to being a husband and a father of four children, he serves as a Firefighter and Emergency Medical Technician for the Zionsville Fire Department. Dustin serves his patients with the same quality and care as he would his own family member. Dustin is a member of the Zionsville Fire Department Safety Committee, making an effort to reduce firefighter injuries, prevent apparatus accidents, and make firefighting safer for all the members of the Zionsville Fire Department. He has an ability to make people laugh and keep things light around the station. You can always count on Dustin to complete any task that is given to him and to seek out additional tasks. In addition to his work as a firefighter, Dustin acts as a coach to his children’s sports teams, whether it is soccer, baseball, or basketball, he is always volunteering his time to make the game fun for everyone. Dustin is the type of individual who attempts to better not only himself, but also everyone around him. For these reasons, Dustin is truly an ordinary hero. "Our stories are varied but there is one common thread- all three of us struggled with alcoholism and addiction, all three of us did things we wished we hadn’t, all three of us hit bottom, and all three of us were given a second chance to succeed. This is our mission- to give people a second chance at life. And to give them the tools and resources they need to succeed. We realize not everyone wants help, but for those that do we want to make sure they have everything they need to make the impossible possible." Their assistance to those in needs ranges from assistance towards recovery and personal care, to job seeking, to car pooling for jobs and therapy. This is an organization that gives a "hand up" and not a "hand out." Folks who seek care from Karma Connections want to learn to fish, not just be fed. Jen has spear headed this project and I was amazed at and appreciative of her selflessness and enthusiasm. Most especially, I am in awe of her love of those who may not get the love they deserve. She treats everyone with the respect, kindness and care that they deserve, not only in her role with this organization, but by my side and others' as an outstanding Emergency Medicine nurse. My ordinary hero is Danielle Tooley, the strongest, most enthusiastic and genuine teacher I will ever meet. I first met her walking through the halls of my High School, freshman year. She threw me the most contagious smile I’ve seen and asked me in such a genuine way, “How are you doing?”, which was exactly what I needed to hear. That year she was diagnosed with ovarian cancer. I had her English class that year, and it was an absolute joy to have her as a teacher. She always gave all the energy her little body would allow, climbing on top of desks and crawling under tables to show us the importance of prepositions and the placements of adjectives. Within every class, she would work in life advice about how unique and loved we all are by our teachers, our parents, and God. Around the beginning of my sophomore year, she began going through a rollercoaster of health issues and despite being in immense pain, she still came to school and taught us with all the passion she’d had before the diagnosis. People showed their support for her in rows upon rows of blue-green cheering students who showed up to our Teal for Tooley games. Whenever we needed a pick-me-up, she’d hand us an Encourage-mint that came with a thoughtful compliment, only furthering our realization of how much she cared and payed attention to us. Mrs. Tooley passed away in February 2016, and we students naturally felt empty without her, but we celebrated her life of spreading joy and the love of Christ. Mrs. Tooley made me realize that teaching is all about caring for students and impacting their lives for the better. She brought our school closer because of her impact in our lives. Not only did she teach us that words matter, but that the state of our hearts is what matters most of all. Nominated by Chloe Schaffer - a student who gained wisdom and appreciation for life from Mrs. Tooley. I would like to nominate Dr. Melissa McHenry DDS, MSD as the Ordinary Hero of the Month. She lives in Zionsville with her family and her business is called Zionsville Pediatric Dentistry. Dr. Melissa shows compassion and care for her patients that goes beyond what she is asked. We are lucky to have her in our community! Around 4pm of Saturday April 22, 2017 (the night of ZCHS prom), my son took a baseball to his mouth and two of his front, bottom teeth were pushed back. The injury is called an alveolar fracture in the anterior mandible. He was in a great deal of pain and very scared as we took him to the ER. Once we arrived at the ER, I started texting Dr. Melissa McHenry. I wanted her advice and/or suggestions on what to do for my son. She responded by saying, "Where are you?". I told her. She said, "What happened?”. I told her. We continued to text back and forth for about 10 more minutes. I mentioned to the ER doctor that our dentist was giving me advice and wanted to come in. Dr. Melissa has privileges at the hospital we were at, and so 15 minutes later Dr. Melissa came into the ER and hugged all of us! She held my son’s hand and for the first time since the accident he was smiling! Dr. Melissa’s son was attending his Senior Prom that night, and even though she had a lot going on in her personal life she still came to the ER to be with one of her patients. With limited dental supplies Dr. Melissa was able to gently work with my son to reset his teeth and put a temporary splint on them. The following day, a Sunday, she had already checked on my son by 9am and invited us to her office that afternoon to check on his teeth. Again, she reset his teeth and splinted them. She went above and beyond to make sure he was pain free and felt comfortable. She constantly told him she loved him and comforted him as she went through the procedure. As we were leaving the ER on Saturday, a nurse stopped by our room to tell us what a special person Dr. Melissa is. The nurse called Dr. Melissa "an angel". Dr. Melissa carries herself with a smile all day long. She is always willing to give ANYONE a hug. The ER doctor was beyond impressed with her as well and commented that she never sees dentists in the ER with their patients. Everyone was beyond impressed with Dr. Melissa that night. She leaves her loving mark everywhere she goes. For over a week after the incident she checked on my son daily! He has had a few more procedures done and she has been along his side the whole time. She is truly a blessing and an ANGEL to many of us! She has a huge heart, sweet soul, and a never-ending supply of hugs. We would like to nominate our daughter, Sophia, for The Scoop Ordinary Hero of the Month. Most days on the outside, she looks just like your typical 7yr old 2nd grader. But on the inside, she suffers daily from a disease called Juvenile Arthritis. This arthritis is nothing like the arthritis that occurs from overuse or in elderly patients. JA is an autoimmune disease that attacks and destroys the joints in your body, and in Sophia’s case - her ligaments, tendons and muscles as well. There is no cure for JA and the treatments are unpleasant, even still, Sophia is strong and brave and she doesn’t let her JA win. She doesn’t like to ask for help, and anyone who knows her would say that despite her struggles, she never stops smiling! To watch her struggling, yet never giving up, is amazing. She is an inspiration to our family. We would never tell her she can’t do something because she has JA. She won’t set limits for herself, and will never stop fighting! Sophia was diagnosed with JA when she was 5 years old. It started out looking like a normal sports injury in her toe, but never healed. She currently has at least 7 joints affected by JA, including a few in her hands and feet, both ankles, and her low back/hip. When she is experiencing a flare, she has low grade fevers, pain and exhaustion. Her pain ranges from limping, to needing crutches, to sometimes even a wheelchair. Flares come and go, and are very unpredictable. It’s never a surprise, but always heartbreaking, when she wakes up on a random morning unable to walk. The flares can last for a few days to a few weeks. They make it difficult for her to get through a normal day of 2nd grade, and it’s even more of a challenge for her to participate in the activities outside of school that she loves. Staying active is extremely important for JA kids, and Sophia has always loved being active! Although she’s had to give up soccer completely and take long breaks from gymnastics, she does her best to push through her pain so she can be a part of the competitive cheer team she loves so much. Our family is very involved with the Arthritis Foundation, and we love to participate each year in the Walk to Cure Arthritis. Sophia named her Walk team “Sophia’s Shimmering Unicorns”, and we are blessed to have a large team walking with us full of her friends, neighbors, teachers, school nurse and extended family. Sophia comes up with some fundraising ideas on her own, such as crafts, neighborhood lemonade stands, and this year, helping me create an awareness t-shirt! Our family’s dream is that one day there will be a cure for Sophia and all of the JA warriors, and we will continue to do all that we can each year to raise the funds needed until that cure is found! I want to nominate Meredith Abbitt as the Ordinary Hero because he has been such a positive influence on my kids, as well as many others in the Thornhill community. I opened the responses up to the community because Mr. Meredith has been driving bus for the Thornhill neighborhood since it was built. - Is WONDERFUL!! Couldn’t ask for a better, more caring bus driver for our community!! - Drove our two kids when we moved from Japan to Thornhill in 1990. A wonderful human being!! - Since my son was born, he and I sit on the driveway and watch the bus drive by. Every time we’re out there, Mr. Meredith stops and gives us a huge wave and a smile! 4 years later we still enjoy watching the bus and now my 4 year old excitedly shows his little brother how to wave! Truly, this makes our day. - Has driven my boys to school since they were in kindergarten. He is a kind, sweet, loving man, and we feel so lucky to have had him! - Was so kind to our boys when we moved into Thornhill. He gave the boys both a small bible and to this day they still have it :) Always a wave and kind smile when you pass him in the neighborhood. We were lucky to have had him take our boys to school. - Was actually my bus driver and he still to this day remembers me and will wave as he passes my house. He is a selfless man with a HUGE heart. Can’t think of a more deserving person. - Is proof that you can make a positive impact on people in ANY job if you have passion and the right attitude. What a good man! - Is very kind and gentle. His smile and wave brighten our days! He is very patient with our special needs son who isn’t always the best behaved. But Mr. Meredith works with us to help provide safe transportation to and from school. - Genuinely cares about the kids on his route and the kids love him. This is my daughter’s first year riding the bus and he always welcomes the kids with a big smile. He enjoys his job and everyone knows it. It brightens my day to see him even on a rough morning! Grateful to have him in our neighborhood. - Might just be my favorite person alive. He always is smiling, and knows our kids, always makes an effort to connect with them. I love when my guys are getting off the bus and he sees me; he shouts after them up the driveway, “AND LISTEN TO MOTHER TODAY, BOYS!” Every time. For not living in Thornhill, he is one of the most important members of our neighborhood. - If there were more people like Mr. Meredith, the world would be a better place!! - Years ago, an unlikely sequence of events led to almost 30min of not knowing where my 9 yo daughter was. I will never forget the sound of the school transportation manager when she advised me that I needed to call the police. I’m not sure who was more shaken that afternoon, me or Meredith, but I do know that he immediately circled back and was the first person to hit the streets looking for Grace. I’m fairly certain there is no one else in this word who cares more about the safety of my kids than Meredith. - Is the best! He is so kind and caring and makes sure the kids arrive home safely each day (even when they are little and napping in the back as I had that happen..). As a parent, I will always have peace of mind when Meredith is at the wheel. We are so lucky that he has been our bus driver for so long! - Goes above and beyone! A wonderful bus driver and exceptional person! My girls love him! - Is a great man & bus driver. He has been helping kids in this community for years. My children are in their late 20’s and early 30’s now. He always waves to the parents & other drivers. An excellent driver as well as taking care of our kids safety! Kudos, Mr. Meredith! - Truly brightens everyone’s day because there is not a person her passes in the neighborhood that does not receive that huge wave and smile. He waits patiently as the kids get off the bus to ensure they safely get inside. The kids (as well as parents) are always relieved and excited when the first day of school rolls around and we see that he is back! He has that pay if forward with kindness affect just by witnessing his behavior. - Is a blessing to have Mr. Meredith to be our four kids’ bus driver since 2003. A great man and a wonderful bus driver. He is an excellent model for our kids: to be considerate to others and to enjoy what you are doing. He has touched our kids’ life in a very positive way and we appreciate his services. We LOVE Mr. Meredith! - Not only loves the kids on his bus, but also all the younger siblings that greet him each day. His smile is infectious! - Is such a kind, caring person. He truly cares about all the kids on his bus. - Is never unhappy and is the safest driver who notices the small details. My kids and our family are better for knowing him. The Scoop would like to recognize David Vonnegut-Gabovitch, the co-owner of BRICS (Broad Ripple Ice Cream Station). David is a Principal and the CFO, Vice-President of Browning Investments, Inc. He is also a philanthropist that exemplifies the motto “to serve and lead others”. In his spare time he is actively involved within the Jewish community and serves on numerous boards for non-profits. David is our Ordinary Hero because he acted as The Scoops’ wise trusted counselor, business advisor, and confidant. He was actively involved with almost every aspect of opening The Scoop. He shared his experience for our grand opening, helped create our operating procedures, introduced us to his supplier relationships, and provided insight for the pricing structures. David even offered our 30 new employees to work a shift at BRICS while The Scoop building was still under construction. Though we could have been considered local competitors, we both shared the same passion for touching lives a scoop at a time and striving to make a positive change within our communities. Faith, trust, respect, honesty, humbleness, dedication, loyalty, leading by example, and believing in others are just a few attributes that can be used to describe him. He is the perfect example of how businesses can help other businesses grow and become successful. Both David’s and his wife, Nonie’s, chosen charity is The Indiana Recycling Coalition. This organization works to reduce energy usage and educates citizens in environmental responsibility. The Scoop and Demaree family are honored to call David Vonnegut-Gabovitch our Ordinary Hero! The Scoop Ordinary Hero Award goes to Michelle Weesies, a second grade teacher at Pleasant View Elementary. She has been teaching in Zionsville since 2002. Over the years, teachers deal with many different family circumstances. Whether it’s a current or past student Michelle has always jumped in when a family is faced with a new challenge. “What can I do to help?” That is exactly what Michelle does, helps wherever and whenever someone needs it. She is always thinking of other people. Her thoughtfulness is unconditional. Last month, my heart sank when I heard the tornado sirens and the school went on lock-down as my son’s biggest fear is tornados. Thankfully, I was able to communicate with Mrs. Weesies right away. Amazingly, she kept me and many other parents informed about how our children were handling the situation while also keeping 22 kiddos entertained, distracted, calm and happy. The reassurance received from Mrs. Weesies will always be remembered. Michelle has raised thousand of dollars for the Indy Honor Flight charity through coordinating efforts with all the Zionsville Elementary schools. This organization has transported over 1,500 Veterans to visit Washington, D.C. Top priority is given to senior veterans – WWII survivors, along with those veterans who may be terminally ill. On Veteran’s Day at Pleasant View all branches of the military are recognized and are treated to a slideshow presentation of students whose family member/members served in the military. Michelle dedicates many hours in creating this slideshow for families to enjoy. Her selflessness is truly amazing! I would like to nominate Chrissy Koenig for The Scoop Ordinary Hero Award. Chrissy is a local young mother who, 10 years ago, started an annual event called "Josiah's Ride: Cruzin' 4 a Cure." This is a benefit that raises money each year for a local family that has been affected by pediatric leukemia/lymphoma. Each year, the sponsor child is someone different; the first year it was Josiah Nelson (hence the name); and the last two years, there have been two sponsor families. This brings the total number of families helped to 11. I don't have the total dollars that each of these families have received from this benefit, but it is several thousand dollars each. Chrissy herself has not had personal experience with pediatric cancer; this is just something she does to help others, and this community of families has become very close-knit and a support group of sorts from the experiences with the organization. Chrissy works year-round on this (in addition to her full-time paid job) by throwing monthly birthday parties for the sponsor kids, organizing a float for the Fall Festival parade, and planning all aspects of the October event. This fall will be the benefit's 10th year, and Chrissy is a true hero to these families (mine included)! Please check out the Facebook page dedicated to Josiah's Ride: Cruzin' 4 a Cure. Tom Marron is a community member who has truly made, and continues to make, a positive impact on our town. He sacrifices his own time and money traveling to hundreds of Zionsville High School sporting events to give back to our community. Tom is the man behind the camera capturing moments of our town’s athletes, band members, coaches, volunteers, and cheering section. For years he has shared his amazing photos online; and for every picture purchased he donates all, or a percentage, to his favorite charity. Mr. Marron has given such a beautiful gift to our community. I will share his link so you can see some of the amazing work he has done, and get a feel for the hours, upon hours, he has dedicated to our community. He is truly a gift to our community sharing his art and capturing the spirit of Zionsville. Tom Marron, it is an honor to call you our friend and photographer. My ordinary hero is Anne McKay. She is a pediatric cardiologist at Riley Hospital for Children at Indiana University Health. She has been a second mom to me as well to many others in the community. She selflessly dedicates her life to her hundreds of patients as well as her four children. Anne embodies all qualities of a hero: strength, dedication, love and passion. She goes on mission trips to Jordan where her and a team of qualified cardiologists perform intricate surgeries on fatally-ill children. Without her compassion, the children of Jordan would not have access to these life saving procedures. She is a role model to all the young women she comes across proving that girls can become strong, independent women in the medical field among other things. "A true hero isn't measured by the size of his/her strength, but by the strength of his/her heart." Aaron Coates. While teachers are heroes in almost anyone’s opinion, Aaron Coates goes above and beyond normal expectations. Aaron Coates is a choir director at Zionsville Community High School. He has made countless impacts on the students that have entered his classroom. He spends hours outside of class, writing music for his choirs to perform. Students leave his classroom with a smile on their face and knowing that they have a mentor that cares for them as an unique individual. Aaron Coates is also a co-director of both show choirs at ZCHS, the Royalaires and Choralaires. He spends hundreds of hours each year at extracurricular rehearsals for these choirs. His hard work transfers to the success of the group as they are known nationwide in the show choir community. At the end of the year the show choirs have a banquet where both directors are recognized for their amazing commitment to their students. Seniors are given the opportunity to speak in front of their peers about the effects the show choir has had on them. A common theme of these speeches is how extraordinary of a man and educator that Aaron Coates is. He is much more than an Ordinary Hero because of the dedication he has to his students and the life lessons that he teaches through his classroom lessons. Aaron's favorite flavor, Lemon Custard will be featured as The Scoop Ordinary Hero Flavor of the Month for the entire month of June. 10% of the proceeds from his flavor will go to Aaron's favorite charity: The National Kidney Foundation. On June 3rd, 2015 Lynn Eriks was more than a hero, she was our guardian angel. We were headed to the airport for our summer vacation when we were involved in a horrible accident that left us injured and needing to be transported to the hospital by ambulance. The only problem was that our van was totaled, and it had our suitcases in it for our trip along with our dog since we were taking her to be boarded on the way to the airport. As God would have it, our close friend, Lynn Eriks, was the first one on the scene. She immediately came and prayed over my children and I as we lay in pain and shock. Then, before I knew it she was loading up our suitcases in her vehicle and taking our dog to the vet to be checked out. Lynn's presence at that very moment not only helped to calm a traumatized mother, but it allowed my husband and I to ride in separate ambulances with our children. Without her stopping and tending to us, we would have had to ride in 3 separate ambulances leaving one of our kiddos alone for the ride, and we would have had to figure out something to do with our dog and our luggage. I am so thankful for Lynn and for God placing her on that street at the exact moment that He did! For these reasons, Lynn Eriks is our hero and we will always be thankful for what she did for our family. Lynn's favorite flavor, Scoop Tracks (moose tracks) ice cream will be featured as The Scoop Ordinary Hero Flavor of the Month for the entire month of May. 10% of the proceeds from her flavor will go to Lynn's favorite charity: International Justice Mission. Our first The Scoop Ordinary Hero award (April, 2016) went to Bob Haimbaugh and a donation is being made to the Sam Schmidt Paralysis Foundation. It was not hard to pick my brother, Bob Haimbaugh, who died in February 2010, to be our first Ordinary Hero. He has been my hero my entire life, and to honor his spirit and continue his legacy just seemed like the natural thing to do. The Scoop’s mission statement came from Bob: To Make others feel better about themselves, Zionsville, or the world in just one scoop. Bob always made everyone feel so special. He always made others feel wonderfully and beautifully made and celebrated the differences in others race, religion, social or economic backgrounds. The essay written by third grader, Andrew Demaree in 2002, shows us how much of a hero Bob was. A hero is a person who is a good leader and has a great attitude. It is someone who stands up for me, is kind and teaches me about life. A hero is someone who would be willing to go through anything for anyone. My hero is my uncle. He is a quadriplegic. He is a good role model for my three brothers and me. He has taught me to love life and to love God. He became paralyzed when I was 7. My uncle fell from a tree stand and landed on his neck. He is paralyzed from the chest down but is able to use his arms. He is not able to use his fingers. Even though this was a terrible tragedy he continues to go on with his life. He can still shoot a bow and arrow with special equipment. He can drive a special van. He is married and is a father to three children. Uncle Bob goes to schools, churches and the hospitals to teach others about God. My uncle once came to our school with his new friend. His friend use to be a drug dealer and got shot 8 times. They taught our class not to drugs and how drugs can lead to a bad life. Uncle Bob helps people become enthusiastic about still being a live. He is a good example of a strong believer in God. He prays to him every morning to help him with his day. He doesn’t blame God for his accident. He takes life as a challenge just like a sport. He has made a difference in my life and in my family’s life. And that’s my ordinary hero, Bob Haimbaugh.